Two color variations of callas – a deep purple and a warm rosy pink. Mini callas come in more than just white so bring on the color. Just one bunch of callas would not do. Still wrapped in cellophane and brought straight home from the yearly flower show. The plastic film reflects, transforms, and veils. 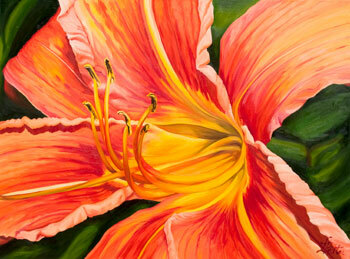 A tiger lily blossom is much like the face of a bird – overlapping petals or feathers surround the center or eye. Colors are intense or even more so than a parrot. 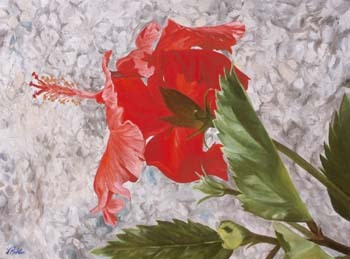 This painting has blown the blossom up beyond big yet even the limits of the canvas cannot contain the entire flower. Fun and bold just as a tiger lily should be. 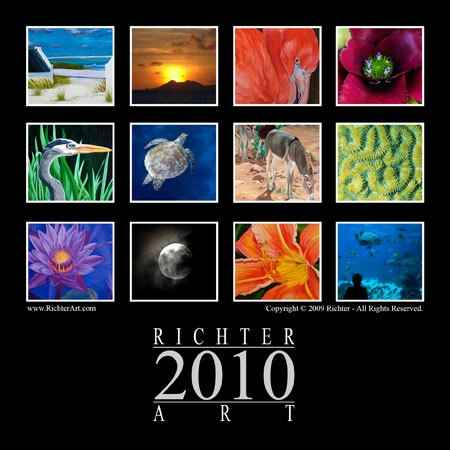 The 2010 Richter Art Calendar sells for US$6.95 and is available now at the Richter Art Gallery on Bonaire. 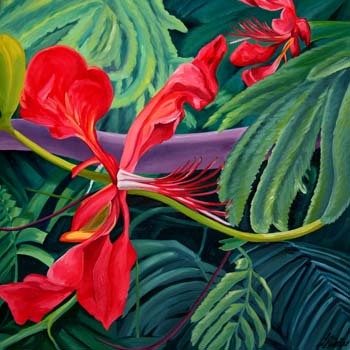 The calendar is available via the on-line shopping site at www.CaribbeanArt.com for those in North America and Holland. 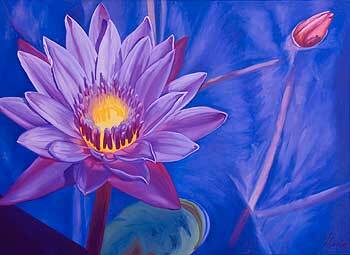 A purple water lily pokes out of the pond’s blue depths. Stems can be seen under the surface. Signed limited edition prints are available in Large size 8.5×11.6″ print area $125. 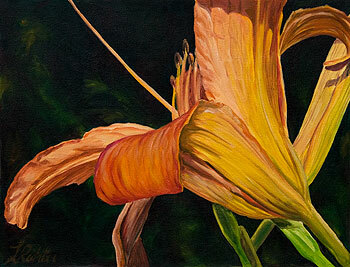 The intense orange and yellow of the tiger lily comes to life. Some just one and sometimes a row of them line the back roads of New Hampshire. Lush and green foliage sets off the brilliant orange of the blossoms. 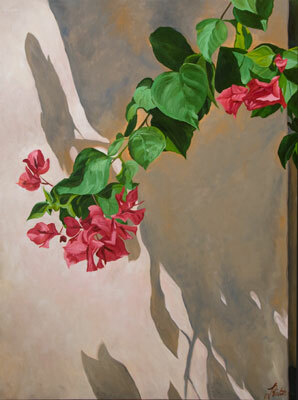 Red bougainvillea casts warm shadows against a concrete wall. The branches wave gently in the breeze. Signed limited edition prints are available in Large size 13×9.6″ print area $125. 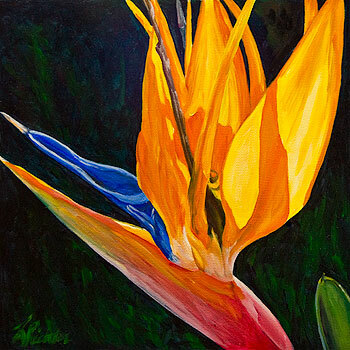 Not my usual type of bird but this bird of paradise is almost as colorful when it blooms. Museum matted and framed in a brushed Graphite metal with plexiglas. The exotic flamboyant tree blooms in elegant red blossoms. The ferny deep green leaves are in sharp contrast to the almost orchid like blooms. 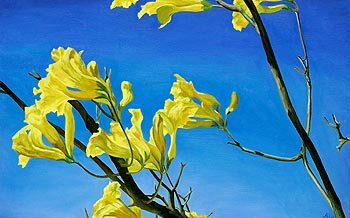 The blossoming of the Kibrahacha (Yellow Poui) celebrates the first showers of the short rainy season with a sudden burst of yellow. Patches of brilliant color dot the landscape anticipating the first signs of green to replace the browns of the drought. After just a few days, the flowers fall and the leaves of the tree begin to appear. Hibiscus flowers abound on Bonaire with the many hues of reds and corals. The flower is a very fleeting thing usually lasting only a day or two. Yet the plant always seems to in bloom with more flowers to enjoy each day.